Black Rhino. Is this an aggressive and bad tempered African animal? Is the black rhino an aggressive and bad tempered animal? 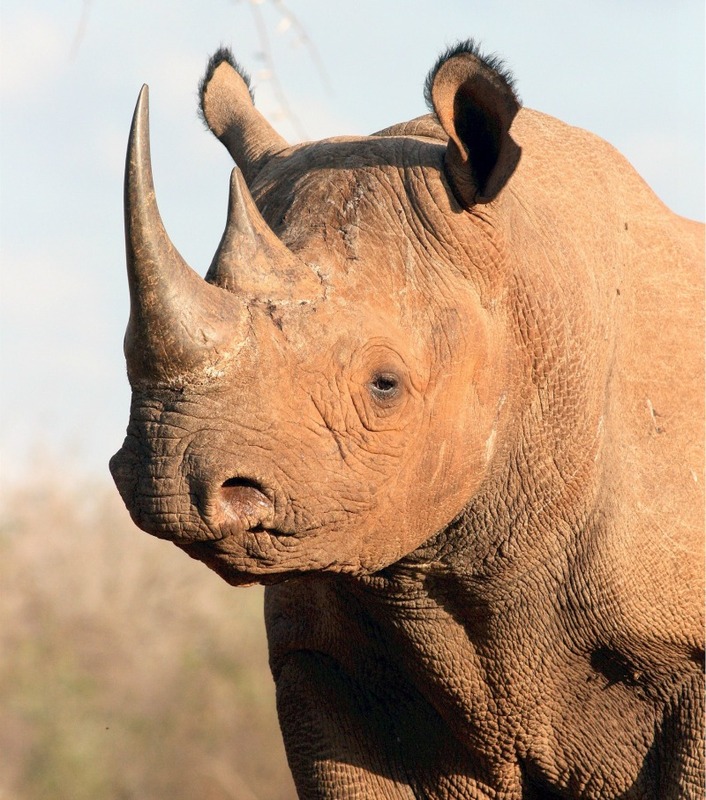 We will answer this question and look at some other interesting black rhino facts in this post. Let's start with the anatomy of this African animal so that we don't confuse them with white rhinos. This large and robust African animal has a dark grey-brown skin often covered with dust and mud. There are two horns on the top of the nose. In order to distinguish the black rhino from the white rhino notice that the front horn has a rounded base. 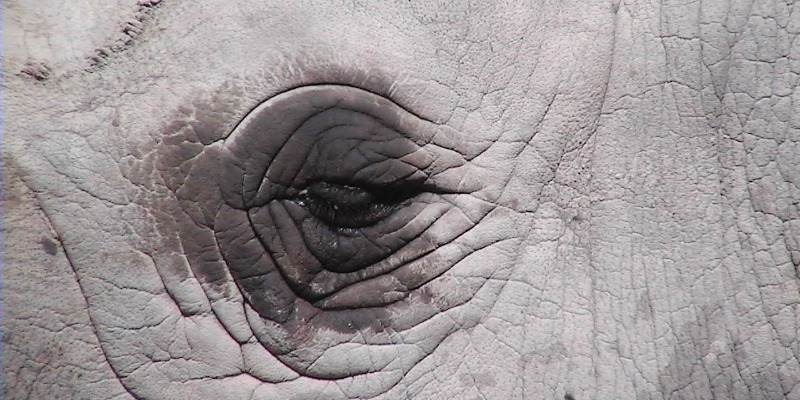 The base of the front horn of a white rhino is straight. The upper lip is triangular and used to grasp branches when feeding. 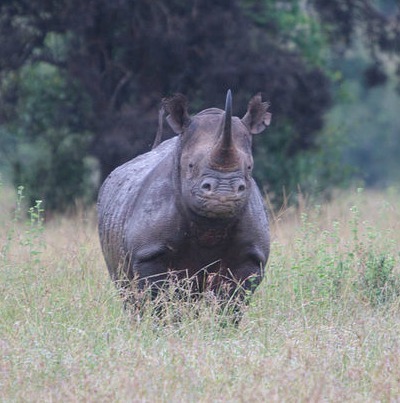 The ears are rounded (narrower in a white rhino) and there is no distinctive hump on the shoulders. The legs are short and solid with three toes on each foot. 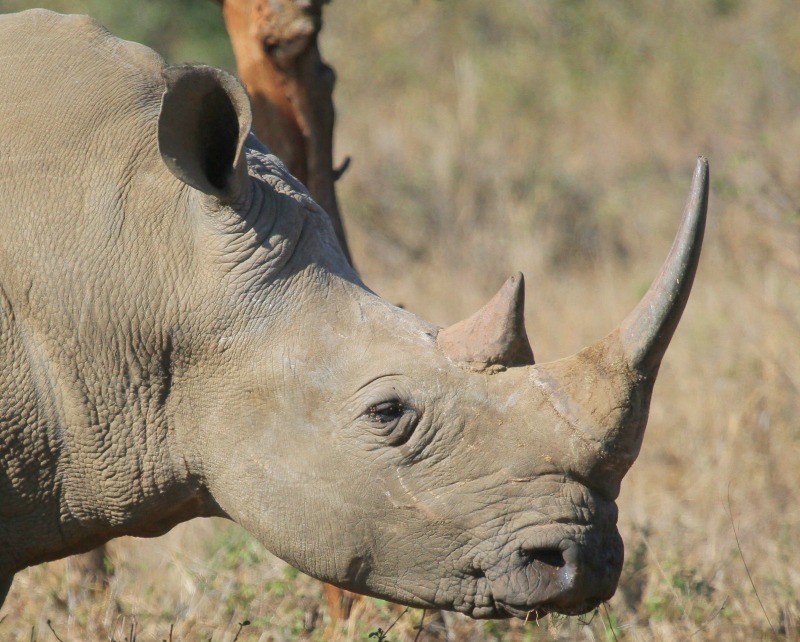 Black rhinos prefer woodlands with thorn tree thickets. The thick bush serves as cover and also reflects their feeding specialization as browsers of small trees and shrubs. These African animals also require access to water and mud wallowing so look out for them at waterholes. They often find a suitable water hole and roll around in its mud, coating their skin with this natural bug repellent and sun block. If you do spot them they will probably not hang around for too long as they are inclined to dash off when disturbed. Look out for some dark sometimes-bloody patches on the side of the body. This is a natural phenomenon and is caused by parasite worms. The black rhino differs from its close white relative by having a pointed upper lip for browsing, rounded ears and a concave back and a rounded head. The calf usually runs behind the mother. They are active for 30-50 percent of the day and 90 percent of the night. What are rhino senses like? Their eyesight is extremely poor and not very effective for stationery object even just a few meters away from them. Their hearing is however very acute and its sense of smell very keen. When there is wind in their favor they can probably smell a human from at least 200 meters away. A black rhinocerous is mainly a browser but will occasionally eat some grass and herbs. It pulls shoots, leaves and twigs into its mouth with its triangular shaped upper lip. This lip is highly mobile and acts much like a giraffe’s tongue. When they grasp branches they pull it into their mouths rather than pulling them apart as an elephant would. A distinctive feature of this African wild animal is that the black rhino neatly slice of the branch tips with its premolar teeth at a precise 45-degree angle. These clipped tree branch tips can also be observed in their middens which is one way to determine that the midden belongs to a black rhino. A midden can however contain both grass and twigs as occasionally both white and black rhino use the same midden. The half-digested remnants in the black rhino dung distinguish it from that of the white square-lipped counterpart. They drink water every day if they can but they can survive for four or five days without it by eating succulent plants. Where surface supplies dry up they dig for water with their forefeet. Black rhino life history - how do they breed? When a female comes into heat the smell of her urine changes. The bull approaches the cow with a stiff-legged gait, his back legs dragging. Initially she may chase him off with an aggressive rebuff or they may spar gently with their horns. The bull prods the female abdomen with his horn. Over a period of several hours the bull will mount the cow repeatedly. Copulation continues for upwards of 30 minutes during which the cow emits low squeals. The calves are preyed upon by by lions and spotted hyenas. A calf can follow its mother only three hours after birth. A rhino calf stays with its mother until it is about two to four years old, when she has her next calf. The mother always leads the calf and will defend it unhesitatingly against actual and potential danger. A calf starts browsing at about three months but will not be completely weaned for about another nine months. Until it is two to four years old it will stay with its mother, by which time she is pregnant again. The mother vigorously repels a calf that stays around until the birth of its sibling. It is a sad truth that the conservation status of this magnificent African animal is "critically endangered"
Why are rhinos poached so heavily? The prominent horn for which rhinos are so well known has also been their downfall. Many are being killed for this hard, hair like growth, which is revered for its supposed medicinal properties in China, Taiwan, Hong Kong, and Singapore. The horn is ground up into a powder form to treat various medical problems and also serves as an aphrodisiac. 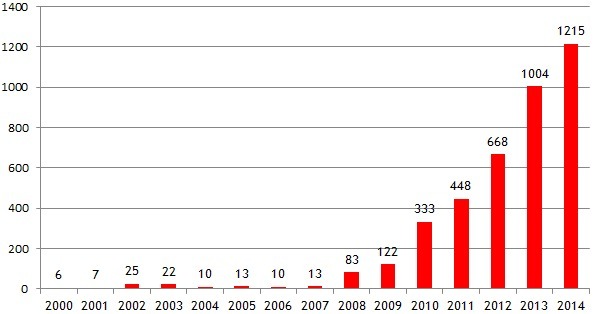 Demand from the East have caused the price of rhino horns to increase to levels that make it a lucrative business. Like we have already indicated rhinos have very poor eyesight and they cannot see stationery objects even just a few meters away from them. This makes them easy targets for poachers. We are currently dealing with a few gruesome cases of rhino poaching in South Africa. The horn is also valued in North Africa and the Middle East as an ornamental dagger handle. The first thing to understand is that we are dealing with very sophisticated poachers, who now are using high technology methods to conduct their criminal activities. These criminals often fly in at night and dart the animal from the air with tranquillizer guns, which takes less than a few minutes to bring down the animal. 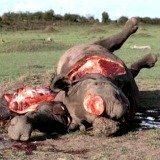 What is the solution to this rhino poaching problem? There are currently numerous proposals in the pipeline and some heated debates about how to resolve this escalating conservation problem which we discuss in our solutions to rhino poaching page. The black rhino does indeed have a reputation for having a bad temper. Black rhinos are generally considered to be more temperamental and excitable than white rhinos. 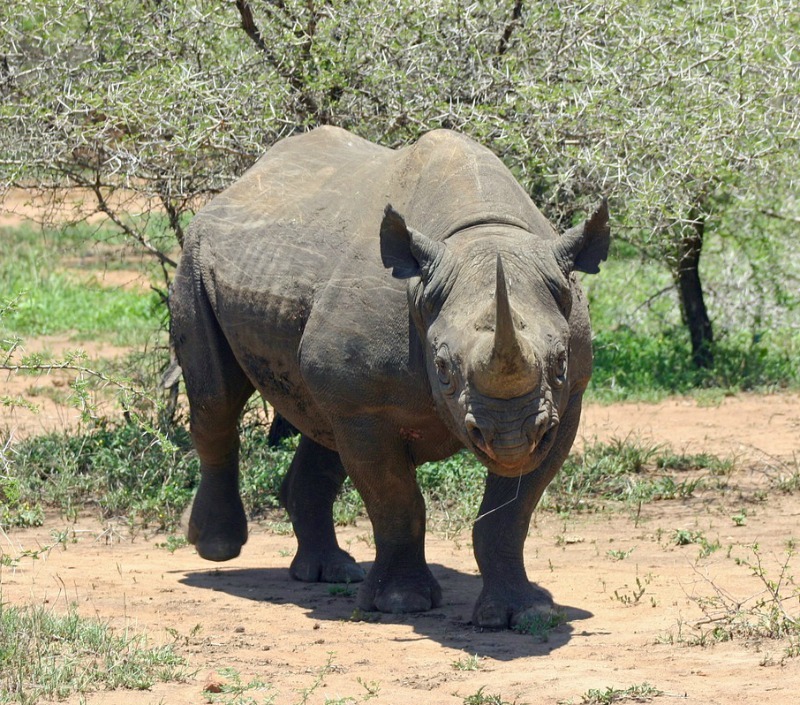 Rhinos can charge at 50 km/h, and are most likely to attack if taken by surprise. 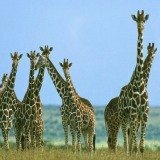 If you are on a walking safari in areas where they occur it is a good idea to move very quietly so that they have plenty of warning of your approach and have a chance to move away. Cows with calves are especially dangerous and will charge under almost any circumstances when feeling threatened. Black rhinoceroses are dangerous when they pick up the scent of a human in the African bush. They can't see well, but they do have a keen sense of smell and hearing. 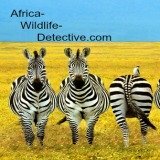 Are black rhinos very territorial? 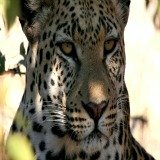 They live in overlapping home ranges of about four to seven kilometers in Hluhluwe Game Reserve. Dominant males may tolerate other males if they remain submissive. Adult males are mostly solitary. Their home ranges are not defended when population density is low and so do not really qualify as territories. It may well be that their scent marks act mainly as signposts for its own use. They scent mark by defecating in dung middens and with urine. The males spray backwards between their legs into bushes while standing still. Females spray, rarely but if they do, they do so while on the move. After defecating in a midden they scrape the ground strongly with their back feet. It is thought that this is a way for them to pick up the smell of the midden on their feet and to then subsequently tread it into the pathways of their home range. Some middens may be shared by a number of Rhinos and serves as communication posts. Passing rhinos will typically sniff the previous deposit before adding its own dung. They can probably pick up information about one another from the smells left there. How do rhinos keep cool? They wallow in water or mud to keep themselves cool and to get rid of parasites. During the midday heat they will rest in the shade. You will occasionally see them wallowing in mud pools. Rhinos also move around and feed more at night when it is much cooler and more energy efficient. 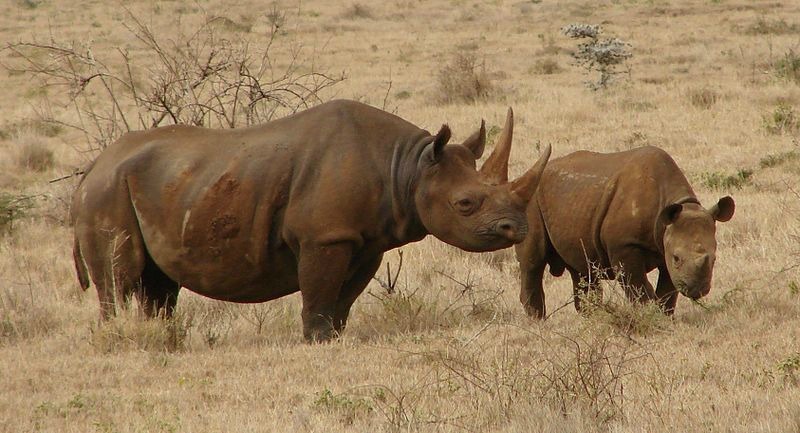 How do rhinos settle their differences? Fights between these African wild animals are rare because they mostly avoid each other. Fights can occur when two bulls are courting the same female. Some disputes are settled without physical combat. Do rhinos have any natural enemies? Because of its size and strength they have no natural predators in the wild. Humans is the reason they are facing extinction. This happens when one male leaves in response to a no nonsense stare from the other or when there is a charge from the one bull. If two bulls do however come to blows they fight with sideways blows of their heads and horns. Fights can become vicious and battle wounds is the main cause of death among eight- to ten- year-old adolescent bulls. During fights they grunt and growl. If startled they give repeated explosive loud snorts. A female calls her calf with a high-pitched mew and the calf calls her with a squeal.